Click to compare TouchPoints™ original and basic. Our best-selling, Edison award-winning TouchPoints™ original pairs with TouchPoints™ app and includes pre-settings for calm, sleep, focus, craving, performance, and anger as well as the ability to customize your own setting. Touchpoint Originals are available for immediate shipping. Please note the bundles are also available with a variety of coloured watchband choices - you can also add additional colours to vary the way you wear your Touchpoints. Please note our wristbands are available in either long and short lengths to fit comfortably. Use our handy watchband sizing guide to find your perfect fit. You spoke and we listened. We've remodeled our popular TouchPoints™ basic based on valued customer feedback. This new model has a sleek design & longer battery life, and still offers the same technology as TouchPoints™ original but is controlled manually without the app. TouchPoints™ basic offers sleep, calm, and anger settings. Also available with a variety of coloured watchband choices available in either long and short lengths to fit comfortably. Use our handy watchband sizing guide to find your perfect fit. 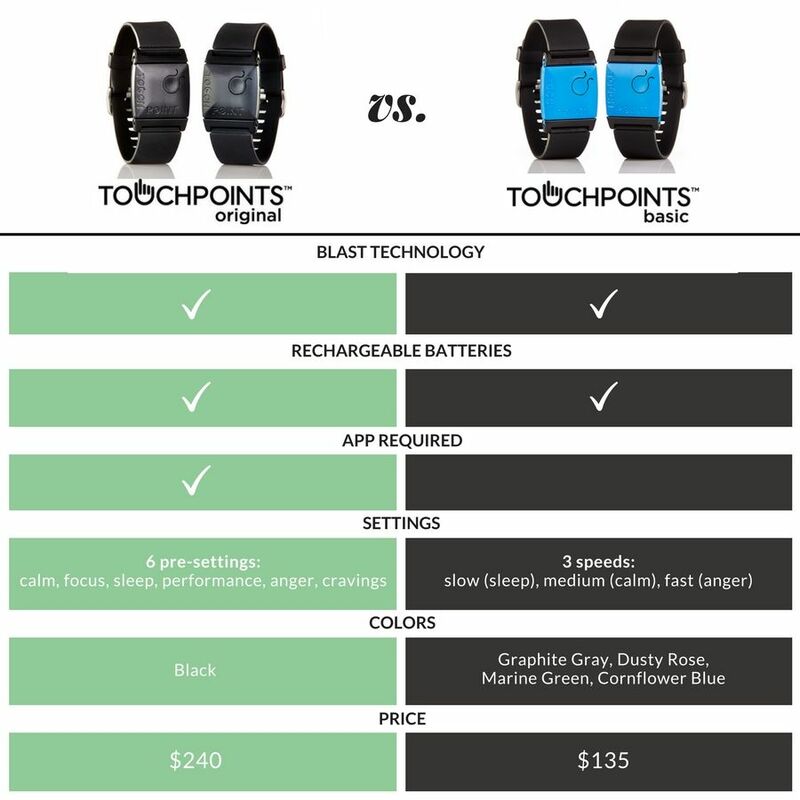 Value bundles include one set of TouchPoints™, one set of watchbands, and an extended warranty. Family packs include 4 sets of TouchPoints™ and 4 sets of watchbands. Get the most out of your Touchpoints, make wearing your devices more versatile with the addition of Sweatbands, Clothing Clips or Watch Couplers. *Both connector products fit Basic and Original Touchpoints.